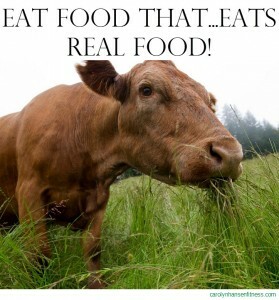 Is Grass Fed Beef For You? If you still enjoy a great steak dinner you are not alone. Humans have been eating and enjoying different kinds of meat since before we can remember and our bodies are well equipped to absorb and digest the nutrients from meat. Tribes that are hunger-gatherers experienced excellent health and most of their calories came from eating meat. Meat is a source of high quality protein as well as nutrients like Creatine and Carnosine…all three important for our brains and our muscles. All red meat is incredibly nutritious even if grain-fed. However, grass fed beef raises the bar even higher on nutrition because the diet that cows are fed has a significant impact on the composition of the beef that it produces. In other words, the nutrients in the beef we enjoy are directly related to what the cow is eating. In other words, the axiom “you are what you eat” applies perfectly. Grass-fed beef contains carotenoid precursors to Vitamin A…such as beta-carotene, contain more Vitamin E (an important antioxidant that protects your cells from oxidation) and supply us with more Iron, Zinc, Phosphorus, Potassium and Sodium. Additionally, grass-fed beef offers between 2-5 times more omega-3’s than its counterpart grain-fed beef along with increased antioxidants, vitamins and minerals. Without a doubt traditional grain-fed beef is highly nutritious and healthy but grass-fed beef trumps it by being nutrient dense. Not only are the nutrients a reason to explore grass-fed beef options, but the way these animals are raised it worth a quick study. Grain-based beef is raised in feed-lots called Concentrated Animal Feeding Operations where they are fed a diet of soy or corn grain and fattened up. Unfortunately the conditions found in these CAFO have much to be desired and these animals are often pumped with antibiotics to protect them from unhealthy living conditions and hormones to grow faster and fatter as opposed to cows that are raised freely on grassland. Is grass-fed beef for you? That a decision only you can make and depends on many factors. You may live in a farming area like Wisconsin where grass fed beef is more easily accessed which keeps costs reasonable. In that case if it fits your budget you would probably be wise to switch to grass-fed beef and take advantage of the extra nutrients and avoid the added hormones. However for some it may be inconvenient…so bear in mind that if you cannot easily access grass-fed beef then don’t eliminate beef from your diet altogether as grain-fed beef is a source of highly bio-available nutrients including protein. Grass-fed beef is leaner with a slightly different texture and subtle differences in taste so you may find that you have to adjust your taste buds a bit. It’s best to just try the different brands for yourself rather than rely on the opinions of others. Like all aspects of diet, people are returning to their roots and focusing on real food…“food that eats real food”, after all, “you are what you eat”. Eating grass-fed beef is just one of many proactive steps you can take that will help you prevent the onset of cancer or some other debilitating disease. Take my free Cancer Risk Test to see how vulnerable you are and what your immediate risk may be.